Perfect, Smooth Blade for Engraving Personal Messages! Ah, Robin Hood. A figure surrounded by so much myth and legend that we can't even be sure if he existed at all. But all of the myth and legends seem to agree about one thing: Robin of Locksley had class, grace, and a nobility of character (if not actual nobility). The Sword of Locksley embodies all of these characteristics. The Robin Hood sword is compact--34.5 inches overall--which is a perfect size for wearing in cramped places (read:forest). 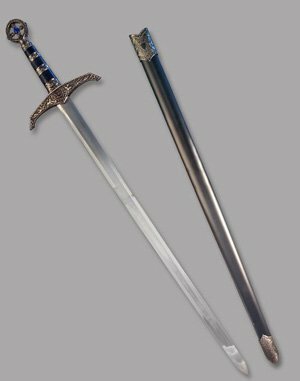 A little smaller than the average arming sword, but much lighter and faster. The sword features a sharpened, stainless-steel blade that is elegantly balanced. Although this is not a battle-ready weapon, it has a sprightly feel in hand and is fun to swing. Both the guard and pommel are made from cast metal with ornate decorations including a Celtic cross and the royal arms of England. The pommel bears the words "Robin of Locksley" on one side and "Earl of Huntington" on the other (The Huntington title was attributed to Robin Hood by playwright Anthony Munday in the 1500s). The pommel is inset with a faux blue "sapphire" that gives the weapon a special touch of nobility. 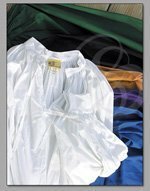 If you're looking for class, grace and style, then you should totally go to a finishing-school. But if you're looking for a sword that has those qualities, then add this to your cart, STAT! (By the way, it's a *lot* cheaper than finishing school.) And add a customized engraving for just $15, too, for that personal touch. 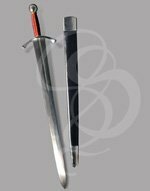 Robin Locksley's sword comes with a black-enamalled metal sheath with etched collar and tip embellishments. Other Materials: Cast Metal Hilt. Decorative Blue Composite "Sapphire" inset in pommel. This sword includes an enamelled metal sheath with decorative throat and tip embellishments.